£50-up for our search engine! Last week we saw Easysearch, the search engine which raises money for Buntingford Town FC,hit over £50 thanks to the 10,000+ searches made with it by club members. 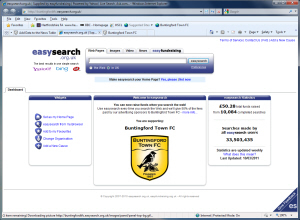 To use Easysearch, click http://buntingfordtownfc.easysearch.org.uk now! At the moment we only have a couple of club members who use the service on a regular basis; double or treble that and it isn't hard to see that the money we raise could grow quite rapidly. Every search generates cash, and if everyone signed on with the club made just 10 searches a day we would earn £££s every week. So, click on the link above, bookmark the page and use Easysearch instead of your usual search engine -and don't forget, Easysearch works from your mobile phone too!